This wild and fruity slot, developed by Novomatic, is a one-of-a-kind, customisable slot game that allows players to play however they like! It’s perfect for beginners as well as for expert slots players who like a classic fruity slot machine and not all of these modern, strange and impossible-to-understand video slots. Wild Spinner slot game will transport you back to standing in a games arcade all those decades ago! The lights and sound effects will evoke feelings of nostalgia for all well-seasoned slots players. This is truly a fruity, old-school slot game with a couple of cool twists – don’t miss it! Players who enjoy spinning the reels of other fruity Novomatic slot games, like Sizzling Hot Deluxe, Hot Chance and Plenty of Fruit 20 will no doubt enjoy playing Wild Spinner and all of the retro features, symbols and sounds this slot game has to offer – not to mention its wins and payouts! Last century, just after slot machines had been invented, they began to spread around the world and become really popular! All that time ago, the symbols on the reels tended to be bells, sevens, stars and fruits and so classic slots players will be happy to hear that Wild Spinner has got plenty of these old-school favourite slot symbols. Not only are they familiar and comforting but they’re also easy to recognise and they make the slot feel more like an actual slot and less like a video game! Gracing the reels of Wild Spinner, you’ll find: juicy oranges, yellow lemons, ripe plums, red strawberries, bunches of grapes, refreshing watermelons, golden bells, red sevens and blue and white stars! As with any other Novomatic casino slot game, you’ll want to match as many symbols as possible to get the big payouts. The paytable displays payout amounts according to your current bet, so set it to the amount you desire before seeing how much you can win! Wild Spinner slot game can be played in a personalised way and you can choose to change the settings to suit you. There are four reels in total on Wild Spinner and you can choose to play on all four or just on three of them. The paytable displays win lines and these pay both ways (left to right and right to left). Each of the reels also has the option for you to add or remove Wild symbols on it. If you choose to activate Wilds on a reel, they may appear with any spin. Any symbol can be a Wild symbol and it will become Wild when it has a star on it. These Wild symbols can substitute for all other symbols so they help you get more wins but they’ll increase the size of your bet if you activate them – bigger risks = bigger rewards! As is typical of most Novomatic slot games, you can play Wild Spinner for fun until you’re ready to play for real! When you are, check out NovomaticCasino’s top picks for where to play online for real money. 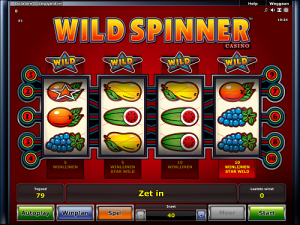 Another couple of standard Novomatic features on Wild Spinner are the autoplay and gamble features. The gamble feature is great for when you want to spice up the game and potentially multiply your wins and the autoplay feature is great for when you’re busy and need to multitask whilst you’re playing the game as it allows you to play hands-free.